Although Georges St-Pierre has won the world over with his flawless fight game and charismatic personality, it appears the UFC welterweight king is the sport’s most stubborn athlete. For some reason, GSP refuses to listen to top contender Josh Koscheck by continuing to train with boxing legend Freddie Roach. Kos brings up a valid point, although I don’t believe “afraid” would ever be the proper term to affiliate with the planet’s baddest 170-pounder. Regardless, prior to his shocking TKO loss to Serra at UFC 69 in April 2007, St-Pierre held a 13-1 record with six of those victories coming via some sort of knockout. That’s an impressive 46 percent clip. However, since losing his title to the overwhelming underdog, the French-Canadian morphed into the game’s best ground guru, and even though he’s currently enjoying a 7-0 run, emerging more untouchable each time he exits the Octagon against “the biggest challenge” of his career, St-Pierre has only ended two via knockout. GSP has been adamant over increasing his KO ratio, as he believes it would enhance his aura of invincibility, as well as his legacy. That’s why for the second time since beating Dan Hardy at UFC 111, the 29-year-old hopped a plane to meet up with the boxing genius. The pair were reunited last week in the Philippines where Roach was working with another one of his superstar clients, Manny Pacquiao. “Freddie has taught me a lot. Before I met him, I thought I knew boxing but he brought me back to school. He’s just so technical,” St-Pierre told Fighters Only. “Since I have trained with him, I’ve been more accurate, been able to hit harder. He has really made a difference with my boxing training. 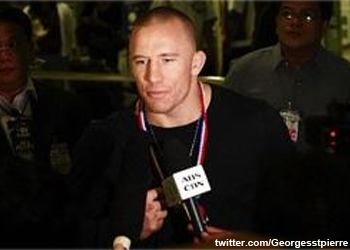 That’s a fairly scary thought considering GSP can’t seem to be defeated in the sport of MMA. The welterweights will headline UFC 124 on December 11th in the champ’s backyard of Montreal.